I can certainly understand how someone could get the impression that I have hoisted myself upon the fork of life, cooked. I’ve always given off that impression. I remember one time, long ago, when I was sharing a small apartment with my brother in Manhattan, on Second Avenue and Ninth Street. I was working part-time at the liquor store, which meant most days I had nothing in particular to do until my shift started in the evening. Some days I’d write, some days I’d try to write, some days who the hell knows what I’d do. Watch TV, sleep, pace, channel Onan, worry, do a few pushups, stare out the window. Anyway on one of those days I spilled out of the apartment building door a few minutes before my shift began. (Oh, how good I had it and I didn’t even know it, work a five minute walk away.) A couple young tough-looking Hispanic guys were sauntering past. Another night I was moping down Ninth Street after work, and a woman from the bar I hung out at happened to walk by. I didn’t notice her, since I was staring at the ground, but she stopped me and told me that I looked like I was on my way to find a corner to curl up and die in. “Really? I’m fine,” I said. A few years later I quit the liquor store the day after a particularly confrontational encounter with a gang of shoplifters. I’d been ambivalent about the liquor store job for a while, and getting involved in another in a long line of racially charged, violence-fringed encounters with a pack of teenagers trying to steal Alize was the straw that broke me. When I told the owner I was quitting he was disappointed, not just that he was losing an employee but that I was admitting defeat. By this point I had come to consider the owner, Morty, like a member of my family. I think he felt the same way about me. I don’t remember how I replied to him, but in my revisions of the moment I explain to him (or to myself) that fighting off teenagers trying to steal bottles of sickly sweet liqueur isn’t my battle. After I quit I spent the summer in Vermont going slowly nuts. I hoped to write a novel, but had no ideas and instead inched through each day by reading old issues of Sports Illustrated in a nearby college library until the evening, when sitcom reruns and beer took me the rest of the way. At the end of the summer I went back to New York City and begged for my ex-girlfriend to take me back and begged Morty to give me my job back. They both agreed, but after a few months my girlfriend showed up one night at my apartment, handed me a Budweiser tall boy, and told me that we had to talk. For a couple months after that I took my liquor store pay in bottles of Maker’s Mark and listened to a lot of Merle Haggard and Hank Williams, but then when that got old I quit the liquor store, this time for good. I really had no idea what I wanted to do. I had no skills, no prospects. I didn’t see a fork in the road. I didn’t see any road at all. But yet on I went, so to speak. I kept writing, fell into significant debt going back to grad school, taught a little, kept writing, lived for a year in a cabin in the woods, came back to the city, kept writing, worked various low-skill jobs, fell in love, kept writing, got married, got a scanner, started scanning pictures of the baseball cards I grew up with, kept writing. I still don’t really see a fork in the road. I guess I never really have. Maybe this is the reason people occasionally tell me I seem to be in the final stages of an irreversible capitulation. But perhaps writing every day is a way to strike a pose as if there is a fork in the road, and as if there is some idea of how to deal with that fork in the road. As usual my Cardboard Gods offer a model for this notion. Here stands Ray Corbin, forgotten hurler of yore. He is at a crossroads of life, though he may not be fully aware or at all aware of it. He is four seasons into what will be a five year major league career. 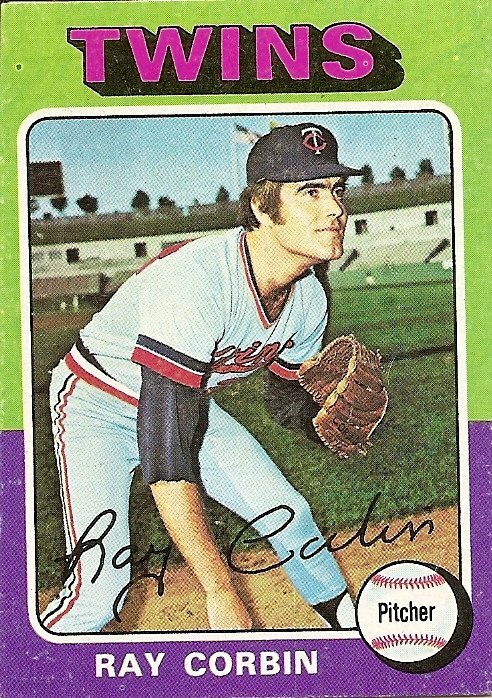 In his first season, 1971, he won 8 games and struck out 83 batters. In his second season he won 8 games and struck out 83 batters. In his third season he won 8 games and struck out 83 batters. An incredible feat! Yet here he stands after his first season in which he did not win 8 games nor strike out 83 batters. But if Ray Corbin is aware of any omens of uncertainty and transience in the ending of his unusual streak of comforting sameness he does not show it. Similarly, his beaming upward-looking gaze shows no cognizance that the end is near. Instead he stands there, striking his pose with the assured solidity of a bronze statue. It doesn’t matter to him if there is a fork in the road or not, or even if there is a road. If there is a mountain in front of him, so be it: On he will go, cutting a path through with his indestructible chin. You are currently browsing the archives for the Ray Corbin category.